ISO 9001 is the globally recognised standard for quality management systems. 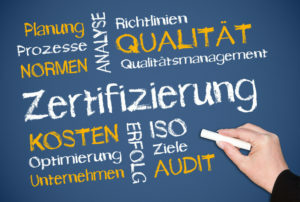 Comprehensive certification service by Rhein S.Q.M. incl. manual, process and work instructions forms, measuring device monitoring, product and process design and project coordination with accredited certification bodies. We guarantee the successful implementation of your management system. Depending on customer requirements, we also offer continuous support for your business-specific QM system after certification. Increased customer satisfaction with the objective of long-term customer retention and optimised efficiency for all your processes. 70% of all certified businesses experience a marked increase in customer satisfaction and profits.